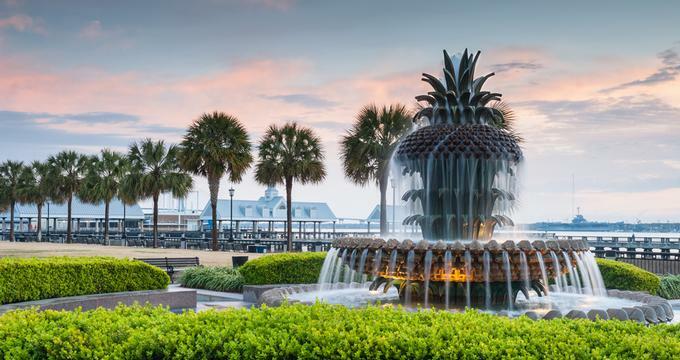 Plan a romantic weekend getaway to Charleston, South Carolina and stay at one of these beautiful inns and B&Bs that cater to couples with attentive service, unique décor and privacy. Check into a room with scenic harbor views, stay in pre-revolutionary National Historic Landmark or enjoy the tranquil surroundings of a former rice plantation in Charleston. The HarbourView Inn is a modern, elegant establishment whose lobby features original artwork and a cozy fireplace. Guests can pick from a traditional room, HarbourSide Room, Historic Room, HarbourView Room, or the suite on the top floor; there are 52 options in total. Traditional rooms have lightweight bathrobes, make-up mirrors, iHome docking stations, mini-fridges, in-room safes, HDTVs, and wireless Internet. You can also pick a room with a view of the harbor, private balconies, or one that has French doors that open out onto the Waterfront Park. The Historic Rooms, naturally located in the historic wing, have 14-foot ceilings and plantation shutters with either walk-in showers or soaking tubs. The suite also has a working fireplace and fold out bed in the living room as well as access to complimentary drinks and snacks. The Inn at Middleton Place provides guests with the perfect opportunity to take advantage of all of the activities at Middleton Place. The inn was a former rice plantation, but it was repurposed; today, it is a stunning property with floor-to-ceiling windows that offer expansive views. There are 35 rooms available, each with a rustic decor that is designed to complement the natural surroundings. 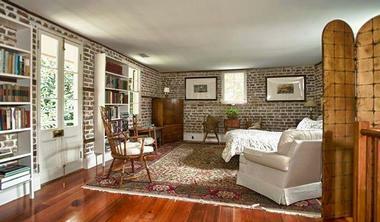 The rooms have hardwood floors, braided rugs, and handcrafted furniture while some also have garden tubs. There also suites available as well as rooms with fireplaces and/or patios. 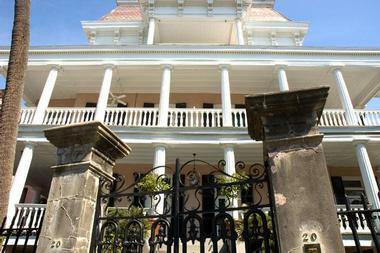 The Palmer House is an 18,000 square foot mansion designed in the antebellum style. The father of the inventor of the first semi-submersible vessel built the establishment in 1849. Today, Francess Palmer is the third-generation owner who runs the bed and breakfast. The building is packed with antiques that are two centuries old, and the bed and breakfast has been operating since 1977. 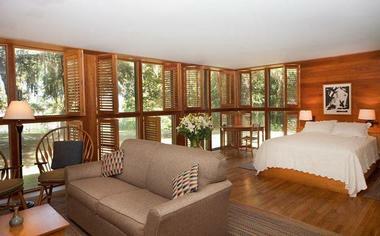 There are five guest rooms in the main house, which can sleep up to ten people. You can either book the rooms individually or as a group for families. The carriage house can accommodate up to six people, although it is designed to comfortably accommodate four people. The Country Club Room is right next to the carriage house, and guests have the ability to reserve it. Every morning, you can enjoy a complete Southern breakfast, while afternoons features a wine and cheese reception. This bed and breakfast is located in the exciting historic district, and it has convenient off-street parking. The inn can accommodate pets for a fee with advance notice. Jasmine House Inn gives guests a chance to relax in an 1843 Creek Revival mansion conveniently located in the Ansonborough area of the city. You can easily walk to City Market and various fascinating historic sights. The inn is filled with reproductions as well as period antiques, and each room has been individually arranged and decorated You can pick a room with a private piazza, gas fireplace, full kitchen, 14-foot ceiling, and/or double Jacuzzi. There are a total of 11 rooms available, including a walk-up flat and several carriage house rooms. Some rooms open right onto the courtyard and have small balconies. For guests who want to do more than simply relax during their stay, there are also several activity packages available, including a golf package and seasonal packages. Throughout the house, you will notice ornate iron and woodwork, 15-foot ceilings, plaster entablatures, and hardwood floors. The building was renovated to its former glory in 1982 before becoming an inn. The Governor’s House Inn is a pre-revolutionary National Landmark with romantic grandeur and modern comforts. Guests can stay in a boudoir stateroom and enjoy the veranda porches and drawing rooms. Each room and suite is individualized and inviting. Some possible amenities include private porches, whirlpool tubs, Italian chandeliers, 12-foot ceilings, decorative fireplaces, hardwood floors, marble showers, four-poster beds with canopies, sitting areas, wing chairs, modern bathtubs, fridges and wet bars, and exterior entrances. Rooms with a private porch are ideal for a romantic getaway and allow you to view the neighborhood while relaxing. Guests can enjoy a relaxing afternoon on the large porch or explore the home with its fireplaces, pine floors, and triple-hung windows. You can also enjoy the dining room and living room, which are cozy common areas. There are special packages available that include romantic amenities, tours of nearby historic homes, walking tours, horse-drawn carriage tours, and more. 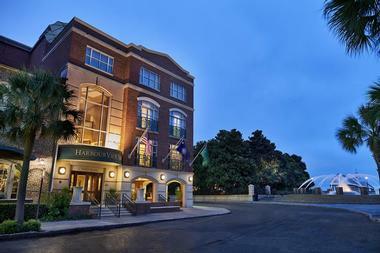 An opulent and luxurious hotel, The Spectator is located on a quiet street between the thriving French Quarter and City Market and only a short walk from Waterfront Park. The hotel draws inspiration from the Roaring Twenties. The elegant rooms and suites have marble bathrooms, smart TVs, desks, Nespresso machines, iPod docks, mini-fridges, and free Wi-Fi. Upgraded rooms also have views of the city and/or balconies, while suites have cozy living areas. Butler service is complimentary. Guests enjoy a beautiful speakeasy-style bar and lounge and complimentary breakfast. The Battery Carriage House Inn dates back to 1843, giving guests the opportunity to stay in a historic building with modern amenities and upscale accommodations. Each of the eleven rooms has unique decorations that create a romantic ambience replete with historic influences. Every room has a private entrance along the brick-lined carriageway. There are three king rooms with large king beds and whirlpool tubs as well as outdoor patio access. The suite has a relaxing and elegant sitting room. There are also rooms with four-poster queen beds, traditional queen beds, and/or romantic canopies. You will pass through picturesque iron gates as you enter the property, at which point you will see the grounds, which offer perfect views of sailboats in Charleston Harbor. There is wine in the lobby as well as several chairs perfect for relaxing. The continental breakfast is light and healthy, and you can enjoy it either in the garden while listening to songbirds or from a silver tray right in the comfort of your room. In the afternoon, tea and sweets are provided. The Battery, also known as White Point Gardens, is a short distance from the inn. 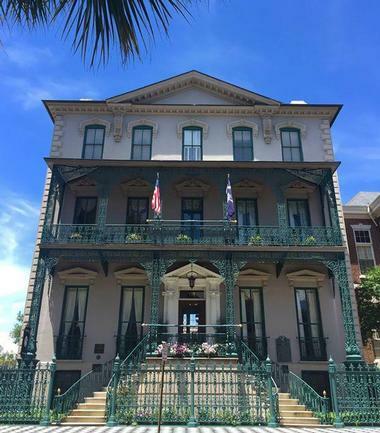 If staying in a bed and breakfast that was the former home of someone who signed the United States Constitution sounds appealing to you, then the John Rutledge House Inn is the place to go. The building, designated a National Historic Landmark, has striking architectural details, period decor, and modern amenities. Guests can stay in the main house or carriage house in a regular room, deluxe room, mini suite, or grand suite. Amenities vary based on room type, but all have private bathrooms, period antiques, and reproduction furniture as well as Tempur-Pedic beds, TVs and DVD players, refrigerators, and cozy robes. Some rooms are pet-friendly and others include bathtubs, Italian marble fireplaces, canopy beds, 12-foot ceilings, whirlpool tubs, and walk-in showers. There is wireless Internet throughout the building and 24-hour concierge service. Guests also have access to a nearby athletic club. The day begins with a complimentary breakfast that you can enjoy in the courtyard, in the ballroom, or in your own room. You have the option of a cooked breakfast or a continental breakfast. Afternoon tea is served in the piazza or ballroom, and you can also savor evening brandy, sherry, and port and nightly chocolates with the turndown service. The Fulton Lane Inn is right off of King Street, and it is known for its relaxing atmosphere with Southern hospitality and modern comforts. There are 45 rooms and suites, each of which has its own unique furnishings and accommodations. You can pick from two-room suites, romantic deluxe kings, petite suites, and more. Possible amenities include tubs, two-person whirlpool tubs, canopied beds, fireplaces, cozy robes, sleeper sofas, microwaves, and separate showers. All rooms have refrigerators as well as wireless Internet. Guests have access to the common areas, a nearby athletic club, and 24-hour concierge service. Complimentary breakfast is served in your room, and there is an evening cheese and wine reception right next door at a sister property. You can also savor an evening sherry, the perfect way to unwind. Families will enjoy the two-room suites while couples will love staying in one of the romantic rooms with a two-person whirlpool tub. This boutique hotel, located in a refined historic building, has 41 elegant, welcoming rooms that call to mind traditional Southern hospitality. The inn is decorated in calming greens and blues with cream and rich chocolate accents. You can choose from one of the 37 guest rooms, 3 townhouse suites, or St. Philip’s Suite. You can select a room with atrium views and queen, king, or double beds. There are also suites with sitting areas, sleeper sofas, and dressing areas. The townhouse suites cover two stories and have a full bath, while the St. Philip’s Suite has Market Street views, arched glass doors, and a Juliet balcony. All rooms have heavenly down comforters and pillows, wireless Internet, a safe deposit box, luxurious bathroom amenities, HDTVs, and iHome docking stations. The historic 1837 Bed & Breakfast is a warm and inviting establishment located in a restored home that has been serving guests since 1984. There are nine rooms that are the embodiment of southern hospitality; they feature a joggling board, rocking chairs, and open piazzas. Guests also have the option of staying in a brick carriage/kitchen house. There is complimentary Wi-Fi and parking on-site. There are six guest rooms in the main house and two rooms plus a suite in the carriage house. The amenities range from room to room, some featuring queen canopy rice beds and extra twin beds. Other amenities include private baths, glass and marble showers, bathtubs, clawfoot tubs, and twin sleigh beds. All rooms have cable TVs, fridges, private entrances, and private baths. The main house also has common rooms such as a parlor, dining room, and kitchen. Breakfast is served every morning on the piazza or in the dining room. It includes tea or coffee and homemade bread like monkey bread, pineapple inside-down cake, blueberry muffins, and banana bread. This is followed with a hot entree and fresh fruit and juice. The Ashley Inn was built around 1832 and features stately federal-style architecture. There are six guest rooms as well as one suite, each of which has a canopy, pencil-post, or four-poster bed. 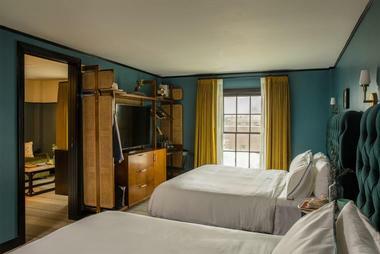 Each room has a private bathroom en-suite, original heart pine woodwork and floors, crown molding, and 12-foot ceilings. There are also modern amenities such as air conditioning and heating, irons and ironing boards, iPod docking stations in the clock radio, flat screen TVs, and digital cable TV. Some rooms also have direct access to the piazzas and sitting rooms and feature comfortable sofas and gorgeous oriental carpets. Guests can also relax in the piazzas, dining room, or spacious parlor. The gardens have a sitting area and gorgeous fountain. If you want ideas of what to do in the area, you can talk to the innkeepers and take advantage of their concierge service. Guests also have access to an ice machine, refrigerator, wireless Internet, off-street parking, and touring bicycles. The inn offers gourmet breakfast as well as afternoon tea with homemade treats and wine. Breakfast includes a breakfast parfait or a hot dish along with fresh fruit, fruit juice, coffee, and tea. Guests can stay at the Charlotte Street Cottage for any length of time, from a day or a week to a full month. This 200-year-old guest house has two bedrooms, and it offers guests a chance to travel back in time while enjoying modern amenities. One bedroom features twin beds while the other has a high-quality queen bed, but both have excellent views of the garden. There is also a full bath, washer, dryer, and plenty of closet space. Downstairs, you will find a breakfast nook, a half bath, an original fireplace, and fully equipped kitchen. Other amenities include two-zone central air and heating, high-speed Internet, cable TV, and a stereo. The cottage is a historic guest home located in the heart historic downtown. It has a nice, sunny patio perfect for an afternoon of relaxing. You can also enjoy fresh fruit and hot coffee in the morning, and there are numerous walking and bike paths nearby. The home, built in 1820, is called the Wegman-Holmes House. An iron and brick fence separates it from the street, and it is situated on an acre of land with natural areas, young fruit trees, stone patios, an expansive lawn, 200-year-old oaks, and more. The parking area is behind a secure electric gate. Belvedere is a friendly inn that strives to give guests a stress-free place to unwind after exploring historic Charleston. The Queen Residence includes two bedrooms and two bathrooms along the south side with wrought iron gates. The rooms have private baths, luxurious bedding, laundry facilities, and in-room safes as well as air conditioning and cable TV. The building has two columned porticos and double piazzas and is conveniently located right across from Colonial Lake, where you will find a ball field, tennis courts, and lush gardens. In the morning, you can enjoy a continental breakfast or choose from the offerings in the well-stocked kitchen. There is also a private dining room, living room, and kitchen. You will have convenient access to wireless Internet. There is typically a minimum required stay of at least a few nights, and the requirement varies based on the season. The Queen Residence can host up to four adults, and there is maid service every several days. This privately owned bed and breakfast is located within the Edmondston-Alston House, which dates back to 1825. Many of the Greek Revival details were added in 1838 during extensive remodeling projects. Today, the building faces Charleston Harbor, and it provides you with the opportunity to stay in a private residence with inn amenities. You can stay in the Private Quarters or Carriage House. Either option has a private entrance and comes with fresh breakfast as well as complimentary access to an Edmondston-Alston House Tour, off-street parking, daily housekeeping, and a well-stocked kitchen. The Carriage House is ideal for one couple, but it can accommodate up to four people. The Quarters has two bedrooms as well. Depending on where you stay, you can also enjoy a second-floor balcony or gas-burning fireplaces. The back area of the property was originally a livery and stable, while the Quarters once served as home to the servants. The High Battery is just a short walk away, giving guests easy access to restaurants, attractions, shopping, and more. This Charleston Historic Home was built around 1790 and is known as the Peter Freneau House; it was named after a famous Charleston resident who lived in the house. The building itself is a four-storey Federal-style home with three levels of porches to enjoy. Guest rooms have 11-foot ceilings, 7-foot windows, architectural moldings, and decorative fireplaces as well as antiques, reproductions, and wide-planked original hardwood floors. There are ten rooms located throughout the four floors. Each one has a decorative fireplace, gorgeous wall coverings, cable TV, air conditioning, oriental rugs, and refrigerators. Daily breakfast is served in the Breakfast Room, or you can enjoy it on the porches. Breakfast includes bagels, eggs, grits, sausage, homemade fruit bread, fresh fruit, cereal, yogurt, coffee, tea, milk, and juice. Guests can also find refreshments throughout the day in the same room. The Inn is just a short walk away from shopping and restaurants on King Street and five minutes from the Historic Market.